We have been hearing from the Sermon on the Mount for the past four Sundays. In Last Sunday's Gospel, Jesus instructed his disciples, "I have not come to abolish but to fulfill the Law". In our first reading (Leviticus 19:1-2, 17-18) we hear from the Law of Moses, which commanded Israel to imitate God in love. But it was a command only partially understood, limited to one's neighbors, one's own clan. But God's love is more perfect than that. The LORD said to Moses, "Speak to the whole Israelite community and tell them: Be holy, for I, the LORD, your God, am holy. "You shall not bear hatred for your brother or sister in your heart. Though you may have to reprove your fellow citizen, do not incur sin because of him. Take no revenge and cherish no grudge against any of your people. You shall love your neighbor as yourself. I am the LORD." In our Gospel reading (Matthew 5:38:48), we continue with Jesus' contrast between the Law of Moses ("You have heard it said") and the Law come to fulfillment in Jesus ("But I say to you"). It is a call to imitate the perfect love of the Father. Jesus said to his disciples: "You have heard that it was said, An eye for an eye and a tooth for a tooth. But I say to you, offer no resistance to one who is evil. When someone strikes you on your right cheek, turn the other one as well. If anyone wants to go to law with you over your tunic, hand over your cloak as well. Should anyone press you into service for one mile, go for two miles. Give to the one who asks of you, and do not turn your back on one who wants to borrow. 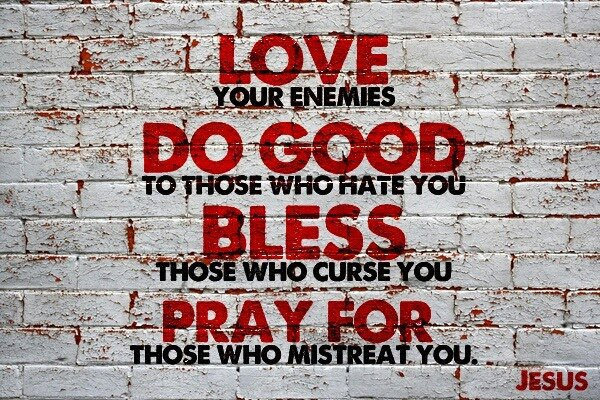 "You have heard that it was said, You shall love your neighbor and hate your enemy. But I say to you, love your enemies and pray for those who persecute you, that you may be children of your heavenly Father, for he makes his sun rise on the bad and the good, and causes rain to fall on the just and the unjust. For if you love those who love you, what recompense will you have? Do not the tax collectors do the same? And if you greet your brothers only, what is unusual about that? Do not the pagans do the same? So be perfect, just as your heavenly Father is perfect." In our Epistle reading (1 Corinthians 3:16-23), St. Paul reminds us that it is the Perfect who dwells within us that calls us to holiness. Brothers and sisters: Do you not know that you are the temple of God, and that the Spirit of God dwells in you? If anyone destroys God's temple, God will destroy that person; for the temple of God, which you are, is holy. Let no one deceive himself. If any one among you considers himself wise in this age, let him become a fool, so as to become wise. For the wisdom of this world is foolishness in the eyes of God, for it is written: God catches the wise in their own ruses, and again: The Lord knows the thoughts of the wise, that they are vain. So let no one boast about human beings, for everything belongs to you, Paul or Apollos or Cephas, or the world or life or death, or the present or the future: all belong to you, and you to Christ, and Christ to God. Jesus gave us the perfect example of how to be holy. We are to love our enemies - as he did, praying for his persecutors on the cross. He does not call us to Be perfect but to Strive to be perfect. And the God who dwells within us will help us.